The Beatles pose with executives from Capitol Records backstage at Maple Leaf Gardens in Toronto in September, 1964. From left: John Lennon, Paul White, George Harrison, Paul McCartney, Geoffrey Racine (holding an award), Taylor Campbell and Ringo Starr. Mr. White designed and compiled several Canadian-only albums by the Fab Four. He's the man who first brought the Beatles' music to Canada – a year before America embraced Beatlemania. He then opened the doors for other British Invasion acts and went on to sign the first wave of Canadian pop artists during the 1960s, including Anne Murray and Edward Bear, in his capacity as Capitol Records' artists and repertoire (A&R) executive in Canada. When Paul White died after a cardiac arrest on March 13, the music industry mourned the loss of a jovial gentleman and creative trailblazer. He was 85. Along with issuing Beatles' singles, beginning with Love Me Do on Feb. 18, 1963, and hitting No. 1 with She Loves You by the end of the year, Mr. White designed and compiled several Canadian-only albums by the Fab Four, including Beatlemania! With the Beatles, Twist and Shout and Long Tall Sally. At his instigation, Capitol Canada also released singles and albums by such other English bands as Gerry and the Pacemakers, the Dave Clark Five, the Animals, the Hollies, the Yardbirds and Manfred Mann. Recalled former Vancouver DJ and Rock & Roll Hall of Famer Red Robinson: "Paul White was the driving force. Without his vision and his ear, we'd never have had all those great British Invasion sounds. That's what put Capitol on top." With his company's coffers filled thanks to that success, Mr. White went on a mission to invest in domestic talent, well before other labels. His first Canadian signing was the Ottawa band the Esquires, followed by the Staccatos (later called Five Man Electrical Band), Alberta-based acts Barry Allen and Wes Dakus and Toronto's Malka & Joso folk duo and rockers Jack London & the Sparrows (which became Steppenwolf). But his biggest Canadian success was undoubtedly Anne Murray. Find out about "that barefoot girl with the extraordinary voice," he instructed Capitol's Maritimes salesman, after seeing her perform on CBC's Singalong Jubilee. Discovering that Ms. Murray was already signed to a small independent Toronto label, Arc Records, Mr. White welcomed her and producer Brian Ahern into his office when they came looking for a better deal. Says Ms. Murray: "Paul gave us everything we asked for. Even when Brian said we'd like strings on the next album, Paul said 'Sure, okay.' We couldn't believe our ears." After Snowbird became an international million-selling hit, Ms. Murray released another dozen albums at Capitol under Mr. White's direction, earning 10 No. 1 singles, 14 Juno Awards (she eventually won a total of 24) and the first of four Grammys. Paul White listened to more than 50 samples a week from Capitol’s English headquarters. "Paul was a lovely man," Ms. Murray added, "honest and true – a real straight shooter – and did everything with such kindness. He was always very supportive of me." Born on March 6, 1933, in the seaside town of Weston-super-Mare in southwest England, the only child of George and Ruth White, Paul grew up dreaming first of becoming a professional cricketer and then later a journalist. After a brief stint as a cub reporter, Mr. White immigrated to Canada in 1957 with the hope of landing a job at one of Toronto's three newspapers. When that failed to materialize, he wound up at Capitol Records, then in Toronto's Queen and Broadview neighborhood, loading and unloading boxes of heavy 78 rpm records. Good-humored and hard-working, Mr. White was soon elevated into the label's promotions department. Years later, a young Deane Cameron was working in the label's warehouse and looked up to Capitol's celebrated creative genius. Recalls Mr. Cameron: "I always made a point of talking to Paul when I first started, because he knew so much about the EMI catalogue, all the English releases that he'd auditioned. He had a really great ear for songs." Adds Mr. Cameron, who later worked under Mr. White for one year in A&R before becoming president of Capitol-EMI Canada (Mr. Cameron is currently president of Massey Hall & Roy Thomson Hall): "We had a lot of laughs together. Like him, I was a Peter Sellers enthusiast, so we found some common ground there." Always on the lookout for what might have sales potential in the Canada, Mr. White listened to more than 50 samples a week from Capitol's English headquarters. He inherited the A&R position in 1960, when his boss asked him to compile an album of music by late English saxophonist Freddy Gardner. Aware that adults were buying albums while teenagers were buying singles, Mr. White began issuing 45s by British pop stars such as Cliff Richard, the Shadows and Helen Shapiro. The day he auditioned the Beatles' Love Me Do and decided to release it was auspicious – although the single only initially sold 170 copies. Mr. White followed it with the group's Please Please Me, which sold 280, and then From Me to You, which inched sales up to about 300. But Mr. White persisted in his belief that this English group had potential, using his nationally distributed promotion newsletter, The Sizzle Sheet, to urge radio programmers across Canada to spin the records. Recalled Mr. White: "When She Loves You got released, things went berserk." The rampant success prompted him to reissue the earlier singles to meet public demand. Paul White, third from left, is shown with members of the Esquires, from left, Don Norman, Paul Huot, Richard Patterson, Gary Comeau and Clint Heirlihy. Taken in the early 1960s. According to Piers Hemmingsen, author of The Beatles in Canada: The Origins of Beatlemania, Mr. White's role in breaking the Beatles is indisputable. 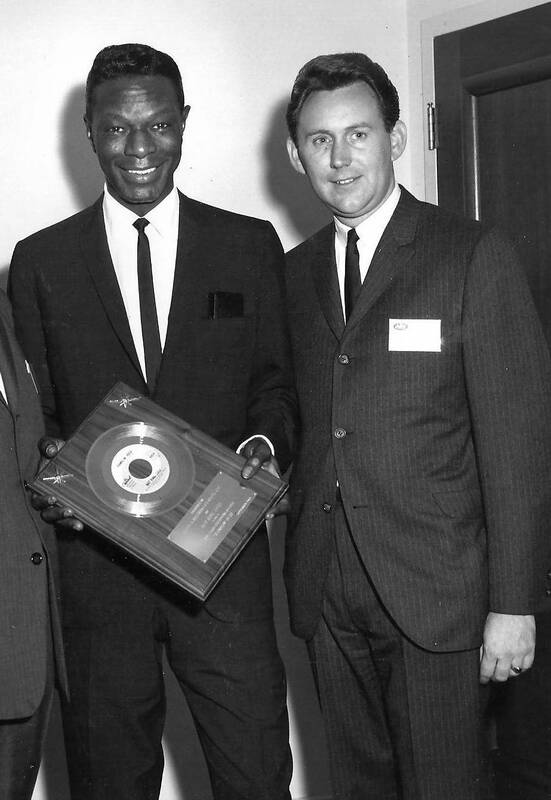 "Some might say Paul White was in the right place at the right time, working for Capitol Records," Mr. Hemmingsen says, "but his counterpart in the U.S. didn't see fit to release those records initially. Paul was simply ahead of the curve. Plus, he was very smooth and charming in his dealings with radio and press people, which really helped." With his English accent, the bearded record executive became a dashing man about town in Toronto, often seen in nightclubs and restaurants sporting an ascot and houndstooth jacket. He hung out with Capitol recording stars like Nat King Cole (his favourite artist) and once dated singer Bobbie Gentry, of Ode to Billie Joe fame. But Marlene Greenbury, who worked with Mr. White during the 1960s, remembers him as genial and down-to-earth, "completely without airs." Robbie Lane had firsthand experience with Mr. White when the Capitol executive leased his material and released several singles and one album of his group, Robbie Lane and the Disciples. "The thing that impressed me about Paul was his willingness to go out and see bands," Mr. Lane says. "It was hard to get record company guys to come out to the clubs, because they had families. But Paul was always eager to hunt out a new discovery." Other artists recall Mr. White's generosity. Danny Marks, formerly of Edward Bear and now a solo musician and DJ at Jazz FM, remembers the time he was in Mr. White's office and the Capitol executive offered him a life-changing gift. "He said, 'Danny, I'm scaling back stuff. Take any albums you want,' pointing at this wall of records," Mr. Marks recalled. "I grabbed Merle Haggard, Buck Owens, Charlie Christian, Willie Lewis & His Entertainers and about 20 others. Suddenly I was listening to all this amazing music and realized for the first time that rock wasn't everything. If you thought Jimmy Page and Jeff Beck were great guitarists – wait until you hear Les Paul, Chet Atkins and James Burton! Paul enriched me greatly with a just wave of his hand." Along with Edward Bear, Mr. White signed such Canadian acts in the 1970s as Beau Dommage, Pierre Lalonde, Colleen Peterson and Domenic Troiano. When he left Capitol-EMI in 1978, to go work for Anne Murray's management company, Balmur Ltd., colleagues and many of the artists he'd worked with, including Sylvia Tyson and the Beach Boys' Mike Love, attended the farewell party that the label threw for him. During the nineties, Mr. White worked at BMG Music Canada as manager of catalogue product releases. One of his projects was Made in Canada: Our Rock 'n' Roll History, a compilation series that mined vintage pop hits. It paved the way for other retrospectives. In his later years, Mr. White and his second wife, Valarie (née Cripps), whom he married in 1984, travelled frequently with friends. When she was stricken with Parkinson's disease, he became her devoted caregiver. She died in 2016. Mr. White never lost his fondness for his English roots and remained a fan of novelist P.G. Wodehouse, British TV drama and radio's The Goon Show. He also kept stocked up on jars of marmite, Bovril and extra-strong Marks & Spencer breakfast tea. Nor did he lose his connection to the early Capitol releases – he could still remember the catalogue number of the best-selling album back then, the soundtrack to The King and I – or the Beatles, taking part in the Fab Four-themed exhibition When the Beatles Rocked Toronto in 2016.